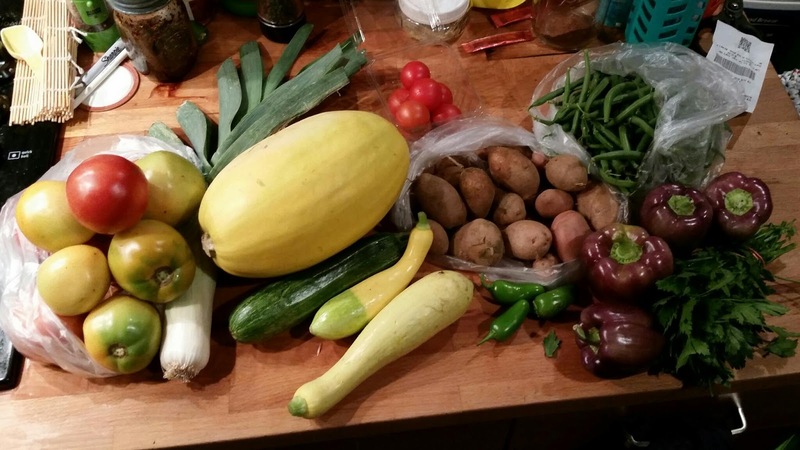 spaghetti squash, potatoes, parsley, summer squash, heirloom tomatoes, peppers, hot peppers, slicing tomatoes, cherry tomatoes, snap beans and a leek. Things have been hectic, and there has been some food waste. I hate food waste. I have to get on top of using these veggies. Thank goodness for the tomatoes. My garden has been a mess this year thanks to the rain. I need to pickle these bell peppers or freeze them, we can't eat them fast enough. I've also been super sucky drying or freezing the herbs. That's been annoying. They're such nice bunches and I'm letting them go to waste. And I have no clue what I'll do with the leek. I braised them using a Martha Stewart recipe a million years ago, I may have to dig that up. In terms of the CSA, I will say on weeks that I'm not cooking as much, it's been hard to use things up before they go bad. I'm also on the fence regarding value. At about $26 a week, I'm not sure it's worth it. Also, having to get there early because some crappy person is either taking things out of boxes, or perhaps swapping stuff so they get the bigger produce, is annoying. The PYO (pick your own) stuff has seemed good with tomatoes, peppers, okra, herbs and flowers being offered. But knowing that just because they list a pint and a half of something in the morning, that when I drive an hour there, it'll be down to only a half pint make it not worth it. The whole situation with the PYO has really left a sour taste in my mouth about the CSA at Honey Brook. If their attitude was more, "Thank you for telling us, that is something we'll work to correct" as opposed to "Sorry if that happened to you once...sorry YOU had such an EXTREME issue..." Okay, that's not a direct quote, but you get the gist. They acted as if I were making up a problem that didn't exist... If you post a quart, then it should be a quart. If half way through the day, you have to reduce that to a pint, fine...but not right after you post it. And to always reduce the amount you can pick on weekends...I mean come on. Box share people can't come during the week, we shouldn't be penalized because I have to work and can only come on weekends. Whateves. I was so excited about this CSA, and now I'm getting more and more blah. I really like this post as I love gardening, especially growing fruits and vegetables. I'll be following this blog from now on, hope to see more great posts.